[deleted post]You wish. It has a huge QWERTY keyboard, 4.1 inch display, 768Mb RAM, Tegra2, it's slim but not 9.9mm, 2 Speakers, 64Gb memory, MeeGo 1.5 with Nokia UI, 1536Mb ROM, 12Mp autofocus with 1080p recording, 2Mp front facing, HSPA+ 21Mbps, Hexaband 3G, Pentaband GSM, N-Gage, WiFi Direct, WiFi 300Mbps, NFC, 2600mAh Battery. N9, 19 Jan 2011CONFIRMED IT IS NOT COMING WITH PHYSICAL QWERTY KEYPAD BECOZ E7 ALLREADY HAVE THIS FORM FACTOR... moreN9! You sure about this phone having triple led flash and full 1080p hd video recording. 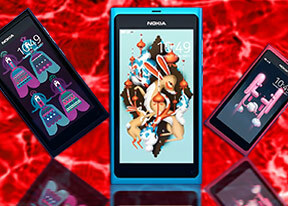 Beside i hope they announce n9 at mobile world congress which will be game changer for nokia. kim, 19 Jan 2011nokia if u want to avoid bankruptcy then you better make a phone that any other phone does not... moreNo. You are wrong because samsung's last cameraphone was pixon12 which is 12mp not 14mp. Anyway it will not have 4 speakers. Beside x7 has it. 2 stereo speaker is enough. I heard it has woofer based dolby digital sound. I don't think it will have 12mp camera because it will affect n8 sales. Every rumor saying it will have 8mp autofocus carl zeiss camera which is more than enough. But you're right about one think they need to build powerful phone which this n9 will provide. I'm looking forward to this year's MWC. First meego os phone n9 will rock the world if they announced it. is it just a rumor or what? and most of people wants good camera in it, lol its a tablet and 12mp camera in a tablet is useless, although it will only increase the price of the phone. auto focus and video stabilizer is necessity. and what about running meego + windows XP on it? I'm definitly through with hardware keyboards. Prefere a state of the art virtual keyboard = lesser bulk & weight, more straightforward & robust. nokia if u want to avoid bankruptcy then you better make a phone that any other phone does not have...try to be more advancing! this phone should be 12Mp..even samsung has 14MP now! MEEGO not symbian but meego should put some symbian features...or could be dual OS like n900 can! hardware should be like in n8! and the OS can be updated like in nokia n900!!! has tons of 3d games!!! QT should be less confusing and please oh please!! ~8mp camera,optical zoom,triple led flash,full hd 1080 recording and playback. ~Aluminium frame body and weight only 135gm. Anonymous, 19 Jan 2011Nokia, no more keyboard please! !I support you,no more keybords in nokia meego phones. Nokia, no more keyboard please!! olaf_peterson, 18 Jan 20111,2 Ghz Omap3??? Not really. And if that would be the case, then there would be no HDMI port, ... moreOlaf how do you know that the N9 will not be announced at MWC ? all well and good to say it won't be released but how did you come upon this information ? Anonymous, 18 Jan 2011This is absurd. First of all nokia has big chance announcing new flagship phone n9. Which has ... moreI agree with you, they need to announce the N9 Meego phone at MWC. If not, they will loose money successively. I hope it will video record at 1080p! It's time for 1080 Nokia! Be one of the first to boost to 1080p! LG has already produced it's phone with 1080p and Iphone 5 will probably record 1080p too. Don't go for 720p! Nokia, listen to me if you want to avoid bankruptcy! Also I second this request: CCD instead of CMOS! Make your phone with CCD and proudly tell the world your camera is not only 12MP but it's CCD!!! Some updated rumors: 4.2 inches 1.2 GHz processor 12 MP camera with LED Flash HDMI ??????? OMG! If that will be true, I will definitely buy a Nokia N9 and drop my Iphone 4 dead! Even though Nokia has good cameras, all Nokia cameras have CMOS sensors. I hope they can make a CCD sensor for Nokia N9! CCD is better than CMOS!!!!!!!!!!!! Mobilemaster, 18 Jan 2011Than what kind of phones they will announce at MWC? Only the X7 and the rumored E6?This is absurd. First of all nokia has big chance announcing new flagship phone n9. Which has new os meego. It's the only big event for nokia to show the whole world the power of meego os. But if this guy olaf_peterson says this phone will not be announced at MWC. What phone will they announce e7,e6 and x7. Dammit we know it's all symbian os. Now i'm not blaming symbian os phone but they're all we have seen before. Is time for some change for nokia and for nokia fans as well. If nokia don't announce this phone at mwc then when? It will be too late because samsung is planning to announce galaxy S 2. Now e7,x7 or e6 is nothing new. Same old symbian os. Nokia i hope they don't screw this up!! !